Coads Green – Bathpool 5 miler 2 1/2 hours ish. From Coads Green village hall exit to the right and fork off right. After 1/4 mile see the footpath on the right. Keep the hedge on the right to a gate and onto another gate into a yard by the farmhouse at West Tremollet Farm. Once on the road, turn left and immediately right past the farm buildings see the footpath crossing the field. Keep the telegraph poles on your left down to a gate. Go straight across this field staying to the right of the barn at 1/2 Acre farm and follow the track, keeping right enter the field on the right. (This field was in corn when we visited so we back tracked to the gate by the barn and followed the wire fence to the corner where a gate lead us back into the same field.) A little way on there’s a stile in the hedge, keep on this line heading towards great views of the tor and cross 5 more fields with sheep and cattle and horses, none took any notice of us. The stile in the fence by the water trough was abit wobbly. Head to the bottom right corner gate onto the road. Turn right and right again into a narrow lane and down to cross a stream at an old clapper bridge at Heronsford, then up to meet the road. 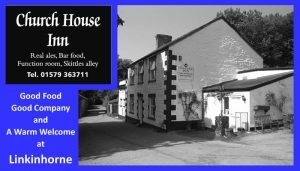 Right takes you to Coads Green so go left to Bathpool village and turn right to the lovely bridge and The Old Mill House. Back track from the bridge and stay on the road as far as Meneth Chy on your right, and follow a track to a diverted footpath taking you up onto a lane and go left. At the crossroads turn right, unsuitable for vehicles, and stay on this track to a T junction and turn left. Past South Combe Mill look out for the pond and see a cross on your left by North Combe. 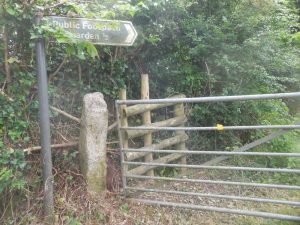 At Westcombe, on the corner, take the footpath into the grass field on the left and see a stile in the hedge at about the 2oclock position, by a tree. Keep leftish cutting the corner you ‘ll see a stile into the next field. Straight ahead spot the stile by some pallets taking you out onto the road. Turn right. At the junction turn left and follow the road back to Coads Green and the start. This entry was posted in Footpaths, Walks on September 3, 2018 by AH. 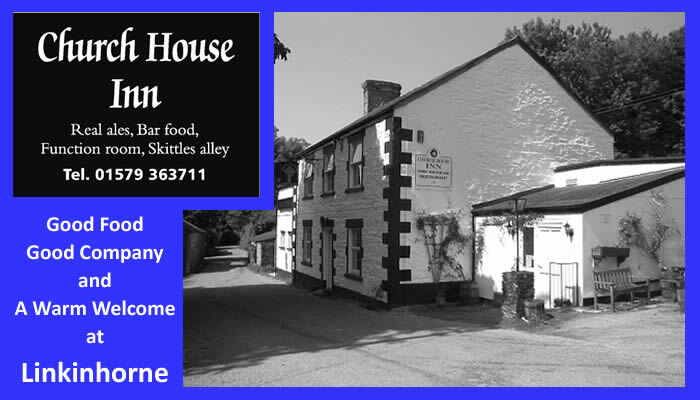 Saturday 16th September … Up the hill to fetch a pint of..
Start: Sandplace Station 10.40 (coincides with train from Looe and No 73 bus from Liskeard)Starting the festival off with a walk up the river then through the woods and the orchards to the Duloe Beer & Cider Festival. The walk will take about one and a half hours, depending on your thirst.. ….Once at the festival you are free to imbibe and leave when ready, there are busses back to Looe or Liskeard. 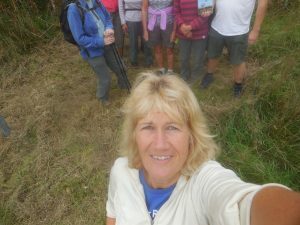 We wanted to lead a walk somewhere different this year, in a part of South East Cornwall we have never explored before. The parish of Quethiock is one of those places few people go to unless they live there, or are lost. So, we intend to go there and not get lost and hopefully learn something about a traditional farming parish. 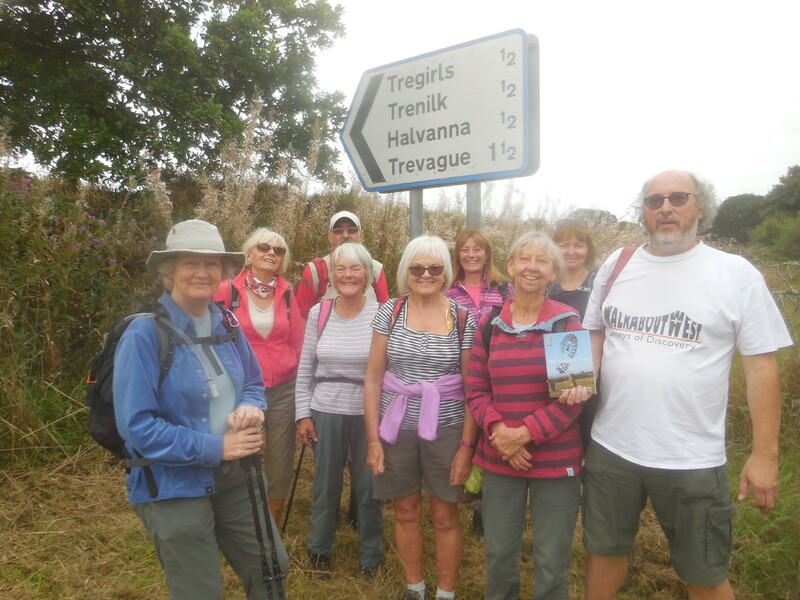 The walk is a mixture of quiet lanes and footpaths covering around eight miles. Some hills and may be muddy in places. Please bring a packed lunch and snacks. The parish of Talland no longer exists, though the church sits proud on the coast between Looe and Polperro. Join festival organiser Mark Camp to explore the surrounding countryside and coastline, much loved by smugglers in the past. Walk is around seven miles in length. Some hills and may be muddy in places. Lunch stop will be at Talland beach where there is a cafe but feel free to bring a packed lunch and snacks if preferred. 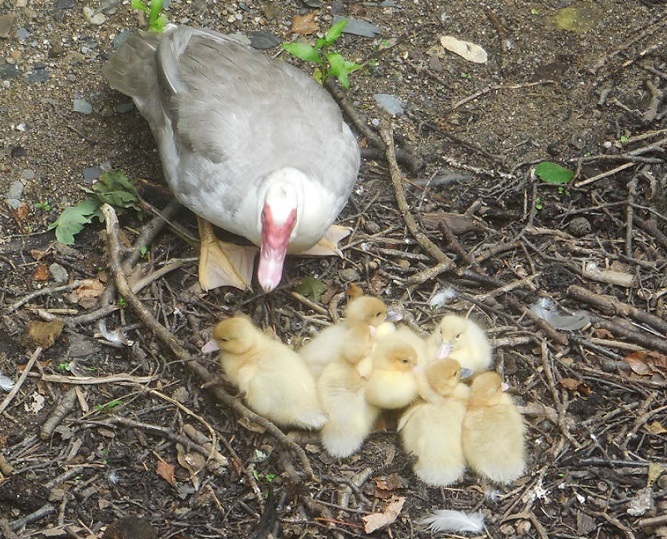 This entry was posted in Events, Footpaths, Health & Wellbeing, Walks and tagged Walk on August 22, 2017 by AH. From Golberdon crossroads, walk through the recreation field, past the hall and the play park, out through the pedestrian gate, be careful crossing the road, into “The Square” and walk down “back lane”. Keep right, passing the houses at Moorland View, and along the path to Trewoodloe lane. Turn left and follow the lane, pass Trewoodloe Castle, Trewoodloe Farm House, Trewoodloe Cottage and turn right into the driveway of Trewoodloe House. Look for the path markers ahead, by the wood pile, keep right then left up the steps and around to the pedestrian gate. Turn left, the path goes straight ahead, through the gate, keep the hedge on your right to the next gate, and straight on, down across the steep grass field to a metal gate. Through here you go straight ahead towards the farm house and left down the driveway, coming out at Berrio Mill. Turn Right, see the old well on the right, and follow the old leat along the quiet road to Wagmuggle. (A great name, the origin is not known but is shown on a 1748 map) Turn left by the house and down to the stream, cross on the granite footbridge and enter the grass field. Keep the wire fence on your left. The river Lynher can be heard a few hundred yards away. Go over the stile and keep straight ahead. The reeds on your left are a good indication that this land is a flood meadow and attracts wild geese and heron can be spotted on the river bank. 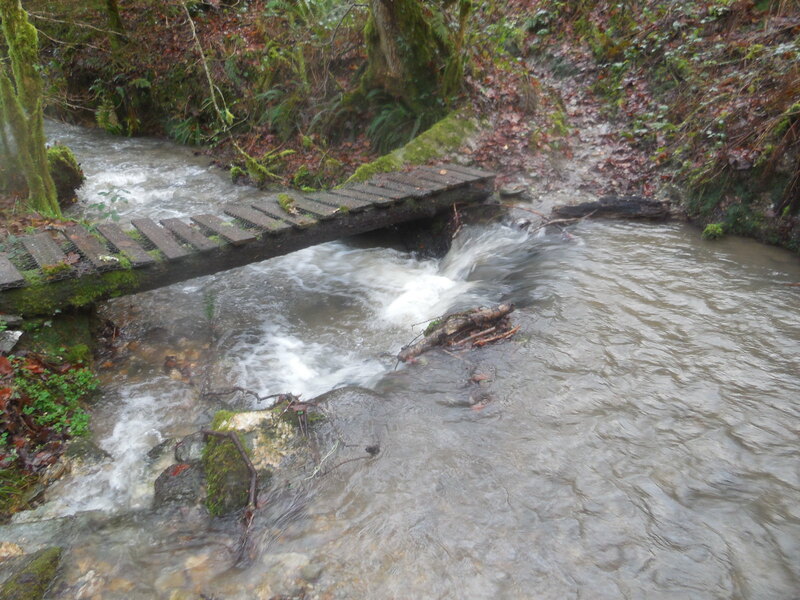 Spot the path on the left as it goes over 2 granite footbridges and through a wooden gate. 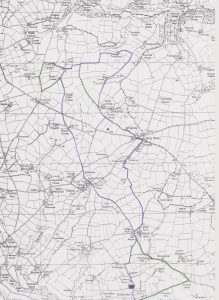 This route was walked by miners from Golberdon and Kerney Bridge to Cheesewring Quarry and other mines. Follow the track, (can be wet after heavy rain) and go through a total of 5 waymarked wood gates, eventually emerging onto the road (near Browda, the house was built in 1602). Turn left, follow the road pass Wales Cottage, Beneathwood Farm (listed building) and an avenue of ancient trees, bringing you to the granite “entrance” posts. 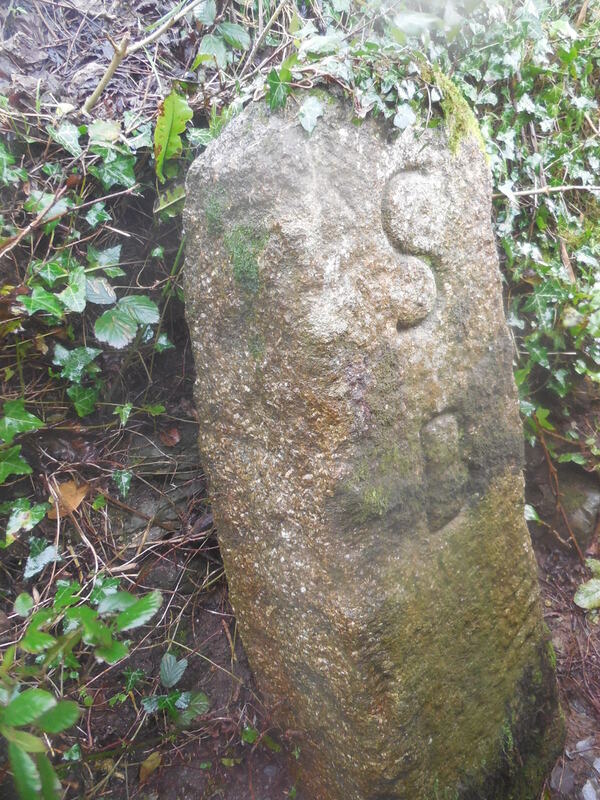 Cross the road, continuing on the footpath, used by fishermen. Over a stile into a grass field, (2 horses were here when walked in July) continue straight ahead, brings you to another stile, partially hidden by nettles, this time of year. Keep straight again, you’re aiming for the house in the distance and the far corner of the top hedge, where you’ll find a gate in gate, replacing the rotting ladder stile. New fencing keeps you to the left over a wooden bridge with stiles either end. Out into the meadow with great views of Caradon, Cheesewring and Sharptor. Keep the hedge on your right, as you walk up the slope, make use of the bench if you want to enjoy the scenery. Navigate past the dog agility equipment to a pedestrian gate and driveway (at Liverscombe) to the main Rilla Mill road. Turn Left, down the hill, past the village hall and The Manor Inn is on your left. Be silly not to stop and enjoy their hospitality……. Your ½ way point. About 3 ½ miles. Continue over the bridge and turn left, following the road past Addicroft to Plushabridge about a mile. The bridge on the left was widened and parapet rebuilt in 1913 by Cornwall County Council. (Built to provide access for the miners of Caradon, to the parish church in Linkinhorne.) These ducklings were seen on July 15th. 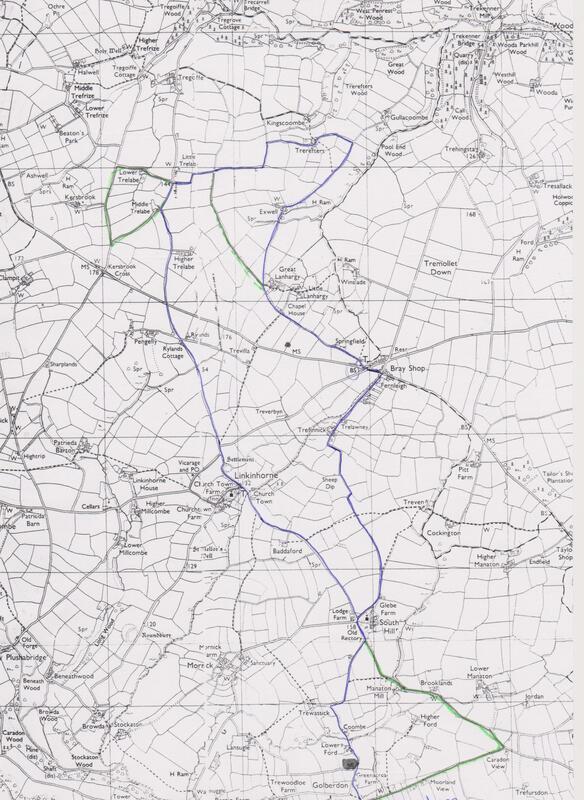 Option 1, if you want to stay on the roads, back track off the bridge and continue straight on up the hill, bringing you to the telephone exchange, turn left and follow the road all the way down to Kerney Bridge and on up into Golberdon and back to the crossroads. Not quite 7 miles. Option 2. Go over the bridge, taking note of the mining cottages on the left, with stones stating CJP 1823. Turn Right and retrace your steps back the way you came. You will have walked close to 7 miles. Option 3. For a longer walk, 8 ½ miles (14km)go over the bridge, turn right, past the footpath used earlier, keep going for 1 ½ miles, passing Browda, and Roundbury (an Iron Age settlement, imagine 2500 or so years ago a thriving community on this back road), eventually you’ll come to Linkinhorne. (You’ve 2 ½ miles back to Golberdon.) Keep right, at the church, St Melors, the tower rises to 120 ft high making it the second highest tower in Cornwall. You may want to take a look at the stocks in the porch and find the slate memorial stone against the east end church wall, which commemorates Katherine Nicholls, there is an amusing verse carved by Daniel Gumb, the eccentric stonemason, born in Linkinhorne on 14th April 1703, died in 1776, lived in a cave, in the shadow of Cheesewring, carved several of the gravestones in the churchyard. Facing the church is a row of cottages, one of these used to house the Sun Inn, in 1841 this small village supported 2 inns. The other The Church House Inn, recently closed, has been called The Stone Masons and …..
Continue around pass the red phone box, on the road to South Hill. In about 300 yards look for the footpath sign on the right taking you through to Mornick. At Mornick turn left then right at the footpath sign taking you to Trewassick, Lansugle, Trewoodloe and back to Golberdon. This entry was posted in Footpaths, In South Hill Parish, Walks and tagged Browda, Golberdon, Walk on July 14, 2017 by AH. From Golberdon crossroads, take the Trevigro Rd, (pass 2 turns on the right) just after FAIRVIEW kennels take the “hidden” path on your right. At the end (Trenavin House) turn right through a picket fence into a 50 acre field and head straight across, this will bring you out, onto the road to Woodcockwell. Turn right and then left signposted to Penwarden. Through the metal gate, keep the hedge on your left to another metal gate, through this one and keep the hedge on your right, around to another metal gate. There are horses here. Keep going straight on and this metal gate leads you into a track, often wet after rain, and through another metal gate into the stable yard and on out through the last metal gate in this serious onto the road at Penwarden cottage. Keep left, following the road down to Bicton Bridge. Work starts here on strengthening the bridge, so it’ll be interesting to see what happens here. 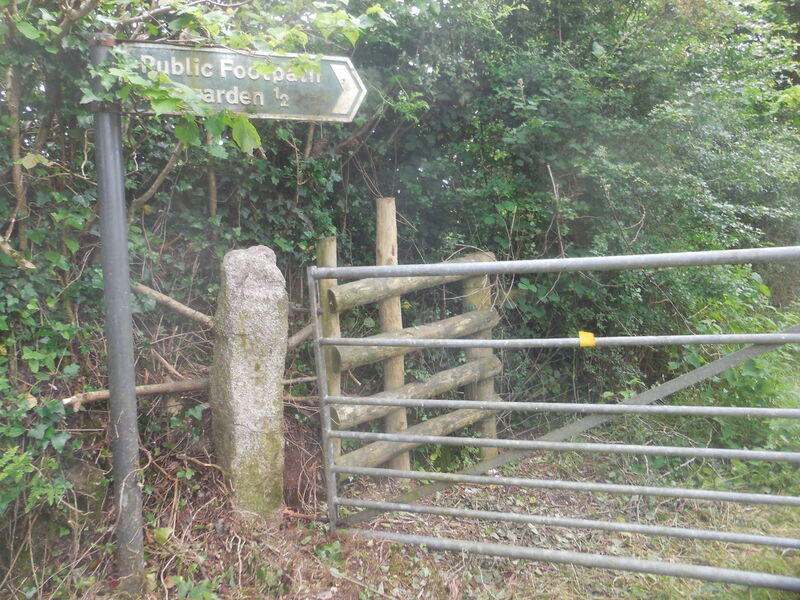 After looking at the river retrace your steps and continue around the corner, you’re on the road to Tregonnet and can continue back to Golberdon, but for this walk, follow the footpath sign to Kerney bridge, over the stile into the grass field and follow alongside the river. This will bring you into Tregonnet wood, pass the swing tyre, up the granite steps, by the handrail and follow the path coming out to a gate with stile beside, over this and follow the path to the road. Be careful here as this is the main Golberdon to Pensilva road at Kerney Bridge. Cross the road and take the road towards Mornick. 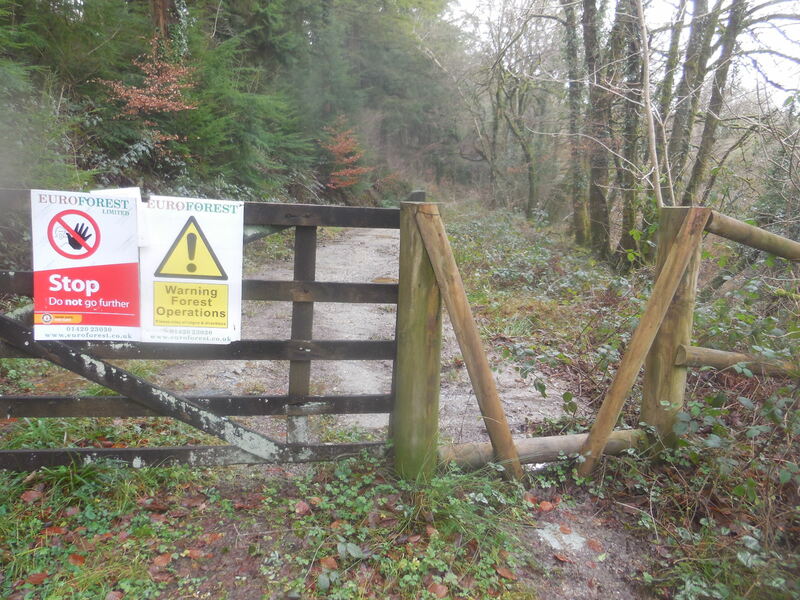 Pass 3 properties and spot the footpath sign on your right, leading up a driveway to Berrio Farm House. Enter thru the pedestrian gate and go straight ahead, up the drive, the path goes around to the top right to a metal gate into a grass field. Through this you’ll spot a post directing you left, straight to the top hedge of a steep field. There are direction markers at the metal gate, continue through this gate and keep the hedge on your left. Keep going to the end, where you’ll see a large drinking trough, go through the gate, into a track, keep straight on pass the post and rail fence and see the pedestrian gate on your right. Follow this path which brings you out into the driveway of Trewoodloe House, and then into the road. Keep straight/left and pass Trewoodloe Cottage, and Trewoodloe Farm House and then Trewoodloe Castle. Stay on the road and you’ll come to a Footpath sign on your right, directing you along a path and then passing houses at Moorland View. At the end, keep left and stay in tight left, avoiding the road, and you’ll pass behind the Old Post Office and walk up “back lane”, into “The Square”. Take care coming out onto the road, and cross over diagonally passing through the pedestrian gate, by the footpath sign, into the recreational field with the popular children’s play area. There are picnic tables here, and a public toilet on the side of the hall and wonderful views, and beyond the hall, you’re back at the crossroads. This entry was posted in Footpaths, Health & Wellbeing, In South Hill Parish, Walks and tagged Walk on June 27, 2017 by AH.